← Pro Amnesty Equals Pro Abortion? Michael Coren is a controversial Canadian talk show host. He is also an adult convert to Catholicism who has written several books. The Calgary Herald interviewed him about his latest book, Why Catholics are Right. He sounds like my kind of guy. Here are some of his thoughts during his conversation with the Herald. On reaction to the book: “So far, it’s actually been very generous. “The Church changes cosmetically, but the truths and the teachings don’t change and we have to emphasize them. “You don’t change for the sake of change. You keep to those truths and you express them in a more articulate manner perhaps. You reach out to people. We’ve been given God’s guarantee the Church will be fine. That doesn’t mean there won’t be challenges. There’s lots of challenges.” Read more here. 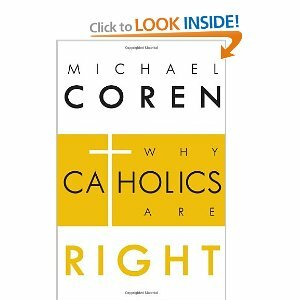 This entry was posted in Catholic Church and tagged Catholic books, Catholicism, Michael Coren. Bookmark the permalink.